The Obecní Dům (Municipal House) is a municipal centre for social and official gatherings. Designed by architects Antonín Balšánek and Osvald Polívka, it is a temple to Czech Art Nouveau and venerates both eastern and western art. Several prominent Czech artists of the day were enlisted to decorate the interiors. 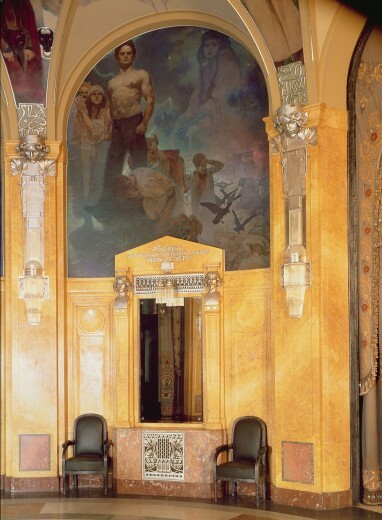 Mucha was commissioned to decorate the circular salon of the Lord Mayor's Hall. Mucha's designs celebrate the heroic past of the Czech people and the unity of the Slav nations. The Slavic Concord on the circular ceiling is supported by eight pendentives on which civic virtues are personified by figues from Czech history. Three wall panels portray representatives of Slavic youth who swear their allegiance to the mother nation.